Scottsdale, AZ, October 3, 2017 — Nestled into the mountain in the highly sought after Ancala Country Club in Scottsdale is where you will find Vista Della Cresta. The property offers magnificent mountain and city light views, in an exclusive and private setting, and will be offered at a luxury no-reserve auction on November 9th, with Supreme Auctions in cooperation with Barbara Lane and Gabrielle Becker of Russ Lyon Sotheby's International Realty. Just minutes from upscale shopping centers, dining options and theaters in Scottsdale, WestWorld event center and TPC Scottsdale, you can't ask for a more optimal location than this remarkable home. A 30-minute drive will place you in downtown Phoenix, home to top museums, theaters, arenas, and professional sporting venues. “The home boasts views of Camelback Mountain and city lights,” stated Barbara Lane and Gabrielle Becker. “The expansive garage is a car lover's dream, offering air conditioned space for five to six vehicles. Refinement can be seen within Vista Della Cresta at every turn with designer touches, art niches, 30' cathedral-themed wood beam ceiling in the living room, and custom finishes that include elegant mosaic-styled flooring. This golf course property showcases a custom wine room and chic formal dining room additionally multi-level living is served by both a staircase and elevator. In the quiet secluded subdivision of Ancala Country Club, you'll gain a sense of community. Recently renovated, the Club offers maintained privacy and seclusion through the 24/7 manned guard gate, while an active Homeowners Association provides ample social opportunities. The Perry Dye-designed 18-hole championship golf course, pro shop, and newly remodeled restaurant and bar with private dining room, offers refined golf-course living just steps away. Vista Della Cresta is just minutes away from acclaimed BASIS Schools, and the Mayo Clinic, ranked the number one medical center in Arizona is here too. Additionally Scottsdale airport provides easy access in and out of the city for corporate and private aircraft. 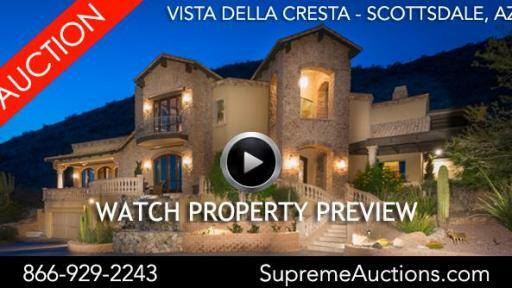 Vista Della Cresta will be sold at a luxury no reserve auction on November 9, 2017. To learn more, contact Supreme Auctions at (866) 929-2243 or visit www.supreme-auctions.com.